Are you a group that wants to look like a HERO to every parent in town? Are you a business looking for way to INCREASE YOUR VISIBILITY in your community? Would you like to see your BUSINESS PRAISED IN THE PRESS? Would you like to get an educational souvenir BRANDED WITH YOUR BUSINESS in the hands of thousands of students in your area? Do you want to feel the profound GRATITUDE of parents because their child is now in a bully-free school? Sponsor the Bully-Free Amazing Wonder Show at schools near you! “Only half of the money I spend on marketing/PR does any good. When you sponsor the Bully-Free Amazing Wonder Show at your local schools, you KNOW you are doing good for your group AND the community! The Bully-Free Amazing Wonder Show is a 40 minute assembly presentation for pre-K to 6th grade audiences designed to give kids the tools to stop bullying. It communicates its message with fun, magic and audience participation. In addition to the live presentation, the program is accompanied by nearly five pounds of support materials (posters, dvd, class room curriculum) and an educational souvenir for each student. Virtually every aspect of the program — from the live show banner to the support materials — can feature the name/message of the generous sponsor. 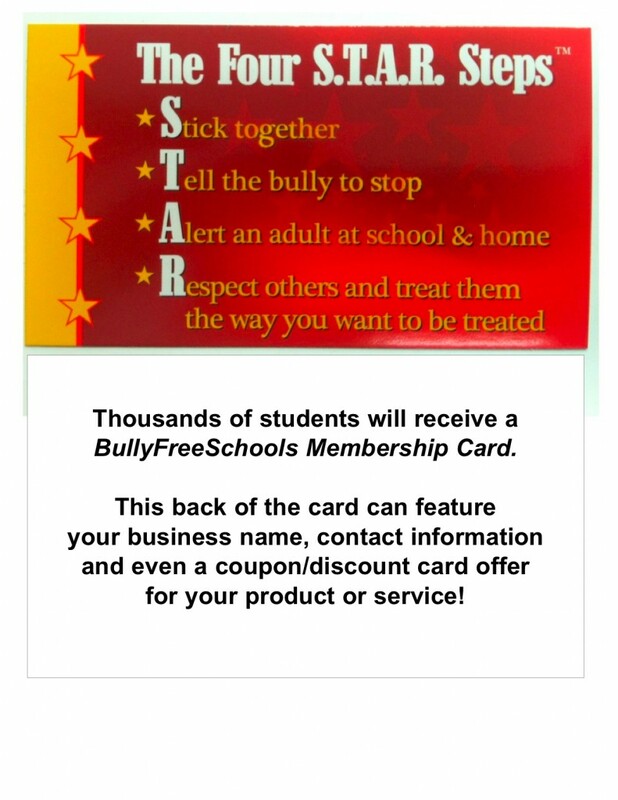 How much would it mean to you to be a local hero and at same time get a coupon in the hands of every child in your community? We have sponsorship packages available for every size business — from as little as a single assembly to multi-assembly plans — all customized to the needs of your business and community. There are many more details we’d like to share with you so you can be on your way to taking advantage of this offer. We have a busy calendar that fills up quickly, so call today.